Today You Die is another ridiculous action film from Seagal. 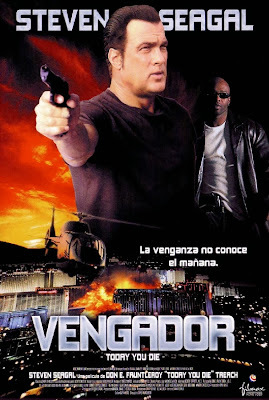 "Harlan Banks" (Seagal) gets a job as a getaway driver for a big casino heist. It turns sour and Harlan goes to jail. In the slammer he meets Ice Cool (Treach, duh) who can help him escape. Meanwhile the brains behind the casino heist think Harlan has the stolen money. When Harlan escapes he dishes out some revenge to the bad guys. 1. When Seagal jumps on a chandelier and kicks a goon 20 feet. 2. When Seagal does any fighting they don't show it. (The stunt doubles do all the work). 3. The glaring continuity errors. He punches a guy in a brown coat and then it switches to a black one. He also wears the same button down blue jacket as in Submerged (2005). He refuses to take off his jacket while in prison with Ice Cool. He is the only guy in the entire prison NOT wearing the traditional prison garb. 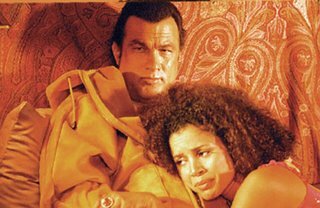 Here's also a line from the movie: Seagal's girlfriend to Seagal on the phone-: "Why are you whispering?" Genius! Besides that, Treach and Stevie have some chemistry and the movie is action-packed. See it if you still like Seagal. For me it was Seagal talking in Ebonics that sold it. I wonder what Randy Couture thought about his two second scene as a goon, or Jerry Trimble. Good stuff. Haha, Randy Couture and Jerry Trimble must have some funny stories working on the movie! Seagal was hilarious in this. Also loved the part where they obviously took stock footage from Top Of The World!